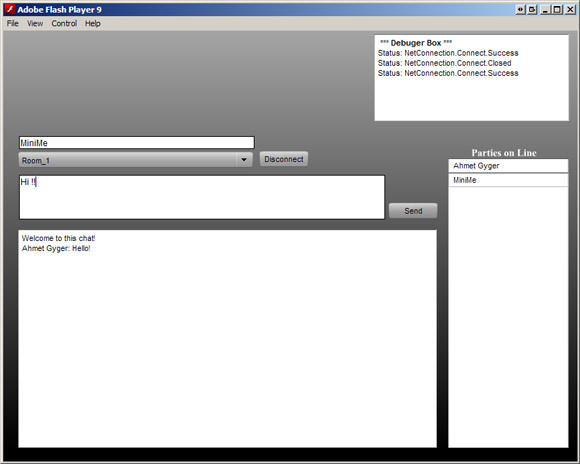 Some days ago I started using FMS (Flash Media Server). Obviously I wanted to write my project in AS3 and realized that they weren’t a lot of documentation on the topic, that why I’ll post here every part of code I made working. My last project was about creating a chat. I downloaded the demo from FMS2 and tried to update it to AS3, not a big deal, but I’m happy that it works now. I didn’t design it in OOP (object oriented programming) as it is only a simple demo, but I think it can be a good start for anybody starting using FMS with AS3. I wrote 2 files, one .fla for the client and one .asc for the server. // send it back out to all connected clients. application.onAppStart: is called when the application is loaded in FMS, it basically inform us that the application is ready to use. application.onConnect: is called when a client connect to this application in FMS, here is all the server logic to interact with the client(s). The .fla is only the for UI (user Interface) and for the interaction with the server. If you have trouble understanding what is happening look at this code where I explain how to call functions from server side to client and from client to server. I know it is not the state of the art in terms of chat but again, this is just a small demo on which complex interaction could be built. you need to download FMS 3 free developer edition to start having fun with FMS. Hi, I’m trying to run the application in my testing server but FMS doesn’t start the application, I changed the server and nothing, am I doing something wrong? thank you. I have some troubles to, i can’t connect to my fms. // is the application instance.